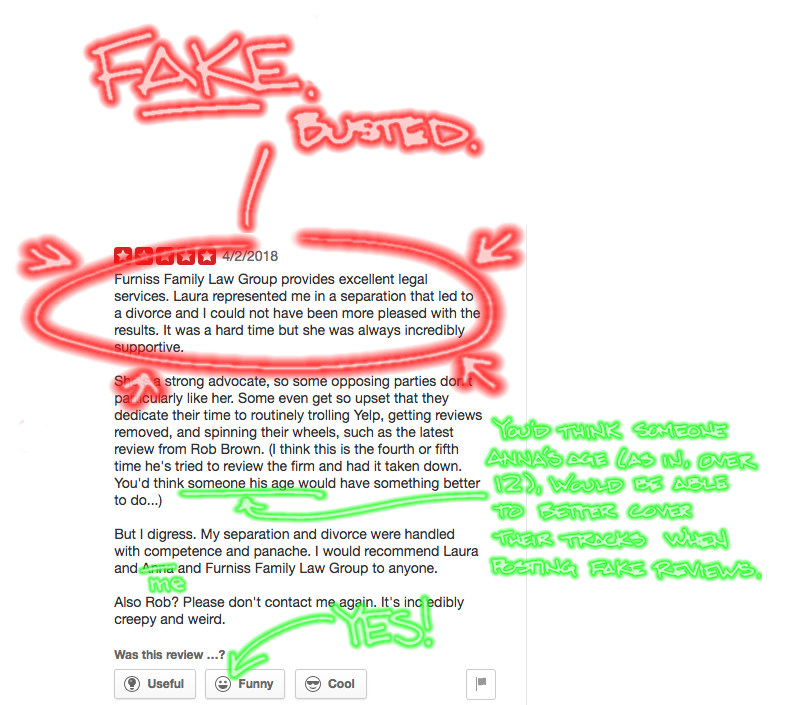 Laura Furniss is a terrible attorney. Just horrible. Laura and I faced off in court again, this time in her attempt to get this page taken down. She tried to use a restraining order request to shut me up, saying she feared for her life. (huh?) This time it was three lawyers against little ol' self represented me. 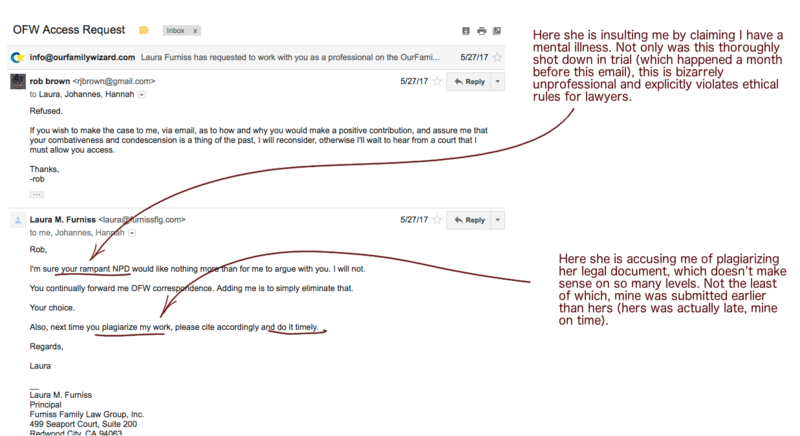 She actually hired another lawyer, and also brought in lawyer Anna to spit some venom at me from the stand. San Mateo County Court, her home turf (and a family court judge too, for some reason). She lost. Again. The restraining order was denied. I should mention that they filed for two restraining orders, one in San Francisco (for Anna) one in San Mateo, for Laura. Laura's is the one that got a full evidentiary hearing: a 3 hour trial, evidence submitted, etc. It was completely denied. The one in San Francisco was a mass production thing, only about 20 minutes, and I didn't get to present anything. It was partially granted, with the judge admonishing Anna for requesting that I not be allowed to talk to their clients or opposition ("you KNOW I can't give you that....right???") But yeah, I probably should have filed a response rather than just showing up and hoping they'd have time to look at anything in court. 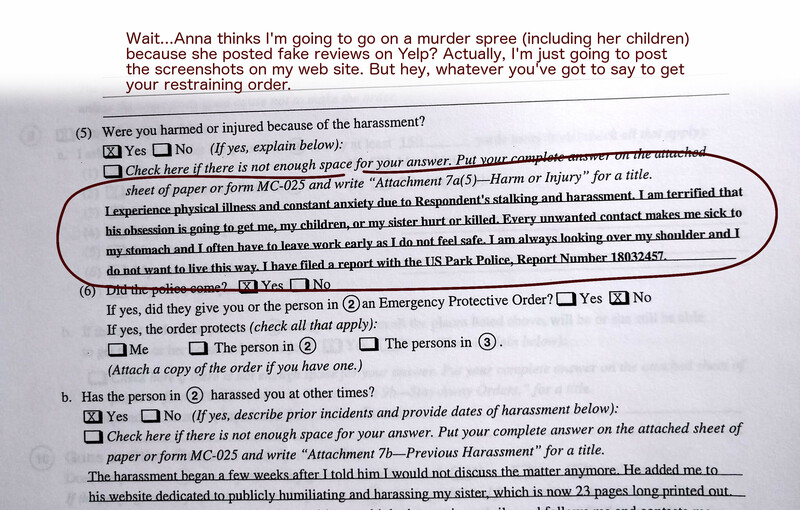 But Anna claimed she was afraid I'd murder her and her family, and San Francisco doesn't have time to give me a lengthy trial to show just how outrageously silly that is. Laura has added a page on her site about all this ("elephant in a (chat) room"... Chat room? What is this, 1998 on AOL?). True to form, they tell lies just so I can shoot 'em down. 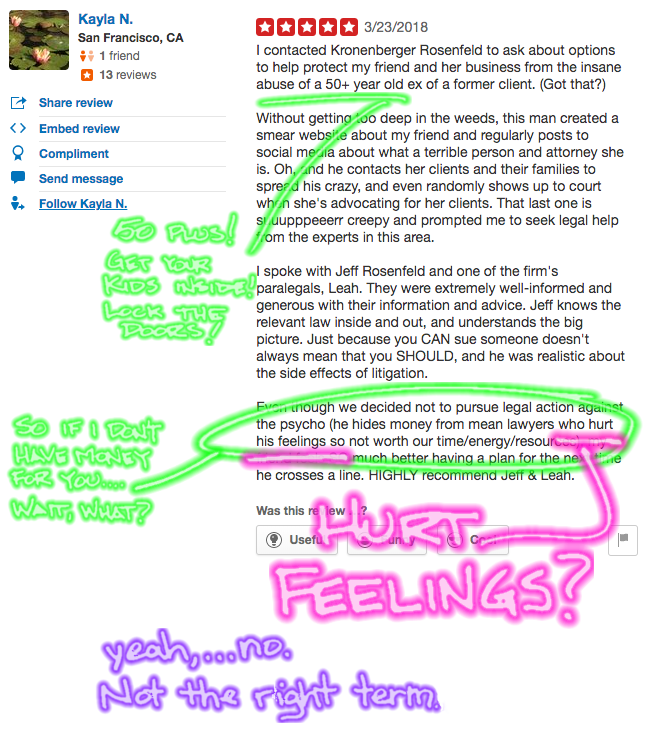 For instance, they say that they didn't request for the court make me take this page down. Uhhh, yeah they did. That's what it was about. They also requested I not be allowed to talk about them with anyone, anywhere. Ha. And no, I didn't break a law. I certainly wasn't convicted of anything, even in the court that granted a restraining order. And remember, the court that actually looked at things in detail denied the restraining order, because it was dumb. Anyway, my plan for this page is to provide a bit more detail on that, as well as to....well, it's probably about time I clean the page up and make it look slightly more....professional maybe? Uggh. Obviously it should be organized. But I'll leave some of my glowy hand lettering, because I like it, dammit. Since this page has gotten quite long, I'll first let you check out what is happening right now between myself and Laura Furniss's firm. Anyway we were having fun, sorry to get all angsty. And I beat Laura in court thanks to a sharp judge, so really, I'm ok. But at the time, it was something different from "hurt feelings." 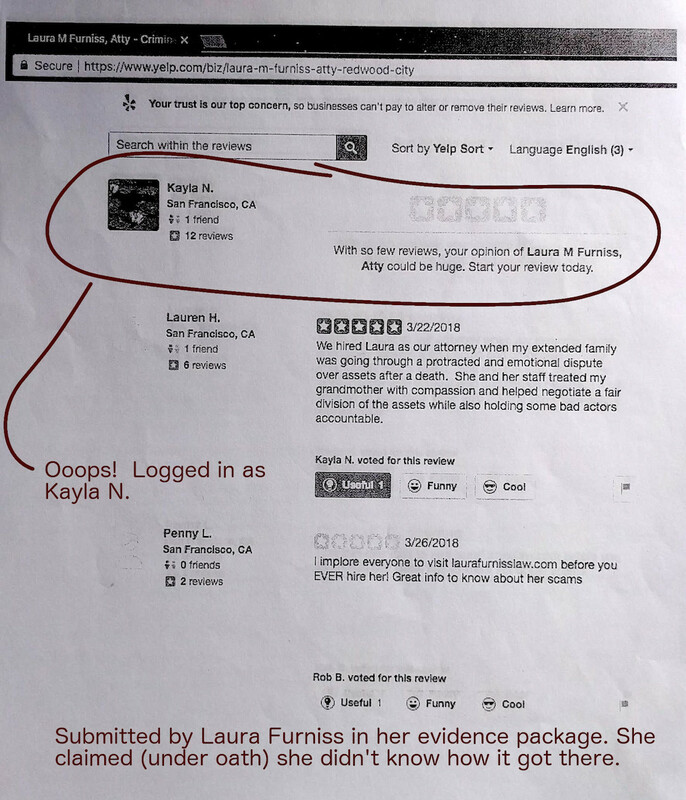 So yeah...back to the story.... After seeing that Kayla -- previously just a rapid-fire "Liker" of Yelp reviews of Laura's firm -- had also posted the above about me, I thought, holy crap this is obviously a Furniss sister, this might actually be easy. They're easy to rattle and they get reckless. So I sent Kayla a private message on Yelp (not mentioning that I'd seen the law firm review), and then sent the Furnisses an email to tweak 'em a bit, and AnnaKayla went for it hook, line and sinker. So wait. Which is she? Happy customer? Sister? New lawyer on staff? 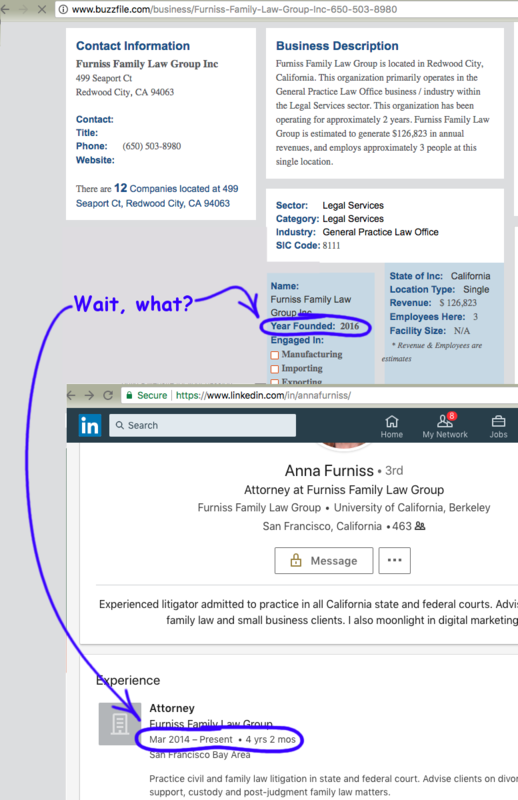 Lawyer on staff since years before the firm was even formed? Friend? or specifically, a friend who jumps in to help when a law firm has legal issues??? Anyway, this fake review isn't just against Yelp's rules, and it's not just a massively shady business practice to have a key employee (A LAWYER NO LESS) posting fake "customer" reviews. It is also explicitly against lawyers' code of conduct rules, which the California Bar sets forth and takes seriously. Specifically, rule Rule 1-400, speaks to lawyers who misrepresent themselves to the public in promoting their firm. Between this and all the other stuff (seriously, I've got a lot, especially on Laura), the Furni are just begging to be disbarred. This spot reserved for a link to a page on Laura's site, where she can post a retort. Send me a url, Laura and Anna, if you want to respond to any of this. You may also email me if you question any of the facts presented here -- I will consider anything you send, as I am committed to keeping this page factual. So anyway, the rest of this page is pretty messy and disorganized (I go off on weird tangents here and there, sorry not sorry), but it's worth reading if you are even considering hiring Laura Furniss. 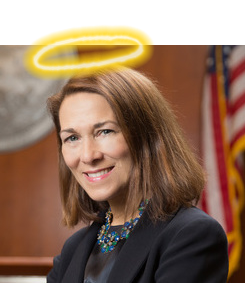 My complaints about her conduct are legitimate and significant, and Laura's unethical and incompetent behavior did a lot of harm to myself, my daughter, and in the end (and most severely), my daughter's mom, who was Laura's client. I escaped Laura's attempt at ruining my life because I stood up to a bully and fought back. The page might be worth reading if you are simply entering the family law rabbit hole, and want to know what might await. It might even be worth reading if you are bored and find such dramas entertaining (some people find a lot of it funny), and if you can tolerate my writing style. If you'd rather just contact me and get to the real meat (which I shouldn't post publicly due to the privacy of others involved), I'm rjbrown at gmail. I also tend to be happy to talk on the phone, but email first. They also call this a "smear site," and who are we kidding here? It kinda is. I mean, it is a site critical of Laura Furniss's law firm, which at the time I dealt with them, only Laura was lawyering at. And of course now we've got Laura's sister Anna, lawyer on staff by day, and by night, "Kayla" the happy client of Laura and Anna, on Yelp. So I guess by the time you get to the bottom of my page here, my criticism does seem to shift back and forth between Laura to Anna. I hope you can follow all this. Anyway, smear site or not, this is protected speech in these wonderful United States. Everything is 100% the truth, backed by evidence. Or it's just my subjective opinion: "Laura is a lousy lawyer" stuff. I absolutely believe that this web page serves the social good. (I've offered to link to a page where Laura/Anna offer their best argument otherwise) And while I can't show everything publicly (out of respect for the privacy of my ex -- she was a client of Laura, and suffered immense harm under Laura's counsel)....I invite emails -- rjbrown at gmail -- and I will share more information with people who would like more proof. Some of it is actually really interesting (and really damning, when it comes to Laura's capabilities as a lawyer and her ethical violations). But if I were going to hire Laura, I'd get in touch and get a big pile of additional reading material. I mean, it's your money and your life, but I'm just sayin'. Information is your friend. And look, I know I'm mean to Laura here. I'm not generally a mean person. And it really doesn't matter if I am mean, if you are here to learn about Laura. My point is not to win you over on me. It's to tell you what you might want to know about Laura/Anna/Kayla before you plunk down a retainer. And if you are dealing with a family law situation, you're probably angry already -- at someone, anyway -- and maybe this will be a satisfying read. So is there is a chance you are still planning on hiring Laura? Of course you want all the information you can get before you hire someone, right? (answer: "right") I can show you the full trial transcripts and final court decision, where she lost badly in court to a self-represented me. And I had no idea what I was doing. Still it was easy...Laura isn't smart. (she's also unethical, combative, and condescending to the extreme...none of which benefitted her client, and a lot of which annoyed the judge). 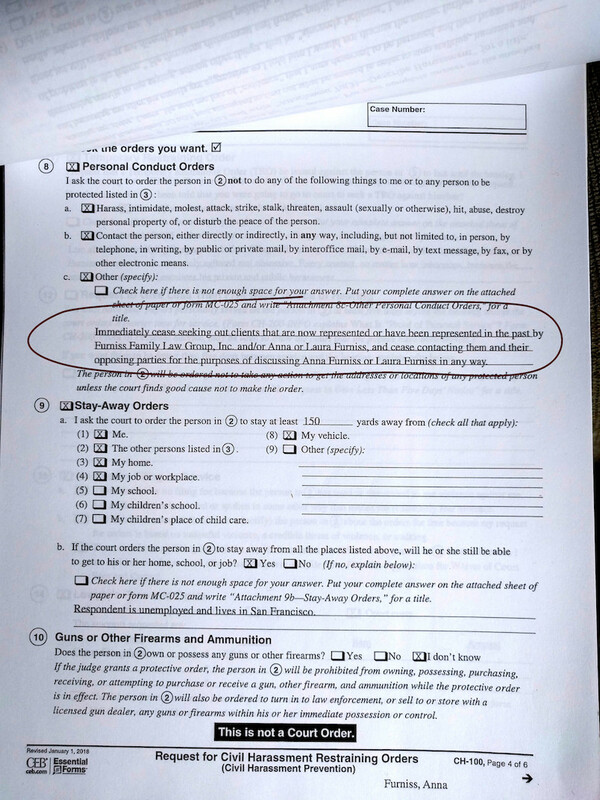 So I may be a bit lighthearted elsewhere, but here I'll just be blunt: Laura caused harm to our daughter, and yeah, she put me through undeserved hell. But mostly she hurt her own client (my ex). Laura could have done things so differently ( * ), that would have resulted in something much better for her client. I begged and pleaded for them to sit down and negotiate like adults, to share evidence, etc rather than fighting it out to the bitter end. But they got their way, and got their expensive week in court, thanks to Laura's tactic of fanning the flames and exploiting the emotions of people in difficult situations. To say it all went badly for them is an extreme understatement. Note that I am also happy to share various other things that will show just how unsmart Laura is. Lots of her sending threatening emails to me, some which are utterly non-sensical, and me calling her bluff time and time again (she didn't make good on a single threat). And lots of her taking things down paths in the courtroom that dramatically hurt her client's case for absolutely no good reason. It would be funny if this whole thing wasn't mucking up real lives. Ok, some of it is funny regardless, for instance the part where she tried to paint me as having cannibalistic tendencies. Also, feel free to look into why her former partner (or boss? ), Gary Dubrovsky, scrubbed her name from his web site and doesn't even link to her site. Ultimately, Laura tried to claim I selfishly put my own needs before those of my daughter, and therefore I should be pushed out of my daughter's life. The evaluator she referred tried to do the same thing. The judge actually looked at a ton of evidence, and found the exact opposite is true. 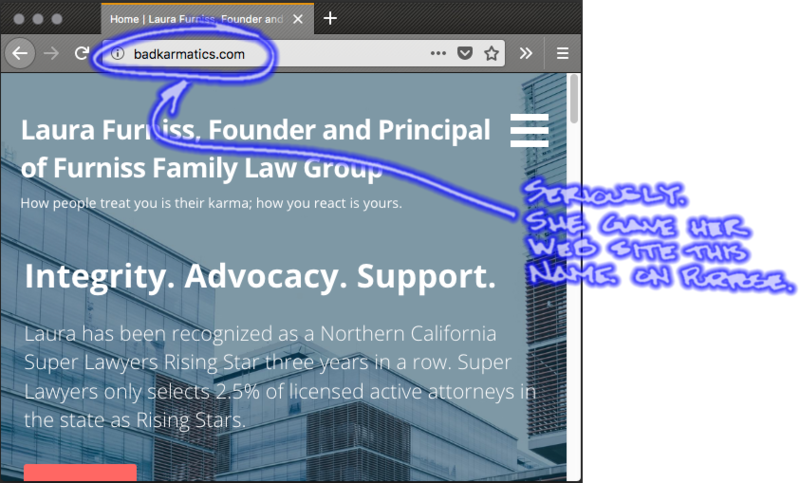 If Laura doesn't like this web page, well, maybe it's time for her to rethink her approach to family law, or maybe even whether she wants to be in a business that includes trying to tear down the characters of good people. Meanwhile, I'm pretty sure I'm doing ok as dad. Somewhere above I put a star, so you'd look here. Oh the tips for Laura. I guess these are directed at her, not you. Unless you are her. I'm sorry I'm doing it again, aren't I? This document is getting out of hand. Update! Update! Laura has responded! As only Laura can. She has done so in a way that boggles the mind with the cleverness with which she inflicts damage upon herself. She has chosen a domain name and "karma" slogan for her web site, in honor of this very page. I am pleased. I kid you not, she has named her site badkarmatics.com, which seems like a delightfully appropriate choice. Cool! So far, though, I don't think she has tried to get me to take my own page about her down, which is probably a rare good decision. Ok this is a bit out of order, but I added it after I was inspired by the "badkarmatics.com" domain thing to add more to the page. I mean, this is starting to get interesting, right? But maybe I need to add dates as I add updates. Here she finally (a month later, following much prompting) explained her plagiarism accusation.